We study orderings ⊴S on reductions in the style of Lévy reflecting the growth of information w.r.t. (super)stable sets S of ‘values’ (such as head-normal forms or Böhm-trees). We show that sets of co-initial reductions ordered by ⊴S form finitary ω-algebraic complete lattices, and hence form computation and Scott domains. As a consequence, we obtain a relativized version of the computational semantics proposed by Boudol for term rewriting systems. Furthermore, we give a pure domain-theoretic characterization of the orderings ⊴S in the spirit of Kahn and Plotkin’s concrete domains. These constructions are carried out in the framework of Stable Deterministic Residual Structures, which are abstract reduction systems with an axiomatized residual relations on redexes, that model all orthogonal (or conflict-free) reduction systems as well as many other interesting computation structures. Khasidashvili Z., Glauert J.R.W. 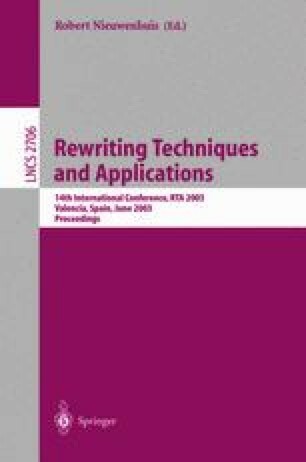 Stable Computational Semantics of Conflictfree Rewrite Systems, available from http://www.cmp.uea.ac.uk/~jrwg/papers/KhaGlaRTARep.pdf.